I learned Ali’s story from our RCIA meetings. She was raised in the Jewish tradition all of her life, attended Hebrew School and like every Jewish girl, when she was 13 “preached” during the celebration of her bat-mitzvah, which is the rite Jewish children celebrate when their congregation accepts them as adult members (Kind of like our own confirmation but without the Bishop… Or the large amounts of cake) As a every Jewish child does Ali learned the Shema Yisrael: A prayer wich comes to us from the times of Moses; and up to this day every devout Jew recites it every morning and every evening. It goes something like this: “ Shema Yisrael adonai eloheinu adonai echad”, which means “Hear oh Israel the Lord your God is one”. This is more than just a prayer for Jews. It is a declaration of what they believe about God: “God is one”. We Catholics have a similar acclamation: “In the name of The Father and of The Son and of The Holy Spirit”. I say it is similar because we also declare God as one: If you haven’t noticed we do not say “in the NAMES” but “the NAME” (singular), because for us God IS one. However we also declare what has been revealed to us by the incarnation of the Lord Jesus, that the One God is not a lonely God but a community, a Trinity of persons … however, our God and the God of Israel are the same God. Now all of this is kind of second nature for us because we’ve been exposed to the Christian faith all of our lives. But for a Jewish person, either a 21st century young woman like Ali or an uneducated fisherman of first century Palestine like the apostles, to think of God as a Trinity of persons is an alien thought! Now, I think it is accurate to say that as observant Jews the apostles knew the Shema very well. They knew God as “One”… Of course, during their time with Jesus they heard him say things like “I and the father are one” and “I am in my Father and my Father is in me”, but these words never really affected the way they thought about God…Yes, they knew these were words of eternal life but not even when Peter, James and John witnessed the transfiguration, they realized they were in the presence of The One God. For them Jesus was the messiah, the Christ, the Son of man. So, in today’s Gospel we are placed right at the moment of Thomas realization about who Jesus really was, the moment in which Thomas stopped thinking with his head and started believing in his heart, the moment of his conversion. A moment which begs the question: How can a faithful Jew who had recited the Shema since childhood, whose prayers were always directed to “the Lord God of Israel” can turn and address Jesus as “My Lord and My God”? What caused this change of mind? The answer resides in what we celebrate today and what we celebrate every week: the resurrection of our Lord. When Tomas realized that Jesus had kept His words and had risen from the dead and that he was able to touch Him with his own hands; in this moment all that he had heard and seemed in the company of Jesus for three years fell into place and he realized not in his head but in his heart that this was not any ordinary Human but God in the flesh. 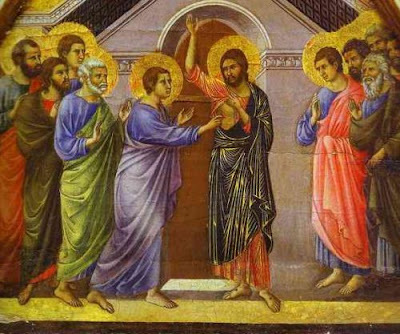 The resurrection caused the total conversion of Thomas and the apostles. It caused them to think of God in different terms. It was not that they stopped believing in the God of Israel, but that the God of Israel had revealed Himself to them in a marvelous way, and now they were able to confess that Jesus WAS the Son of God. From now on, every time Tomas prayed the Shema, he will do it with a deeper understanding of these words because his hands had touched the one True God. My brothers and sisters this IS the message of the Gospel today: To find who this One God really is we need to encounter Jesus resurrected. We need to see him with our eyes and touch Him with our own hands, only them our experience of God will becomes deeper. Every time we find Him, our minds and our hearts will be transformed. And our understanding of the one true God will deepen. As Catholics we have a chance for this on every mass. When we receive communion we are given the chance to touch the body of our Lord. To have an encounter with Jesus resurrected, and to let Him change the way we think of Him. I think it is fair to say that the 4 people who joined the Church on Saturday in one way or another had a moment of conversion like the apostle Thomas, although, perhaps not as dramatic… Speaking for my friend Ali I can tell you that her first encounter with Jesus was through His body the Church. As it happened, her boyfriend asked her to accompany him to mass at the chapel in the University of Maryland. There she was surprised about how similar our mass and some forms of Jewish worship are. This was her first step towards her conversion, by meeting the Body of Christ in worship. In one of the RCIA meetings Ali once mentioned to us that, since her childhood she always wondered why haven’t the Messiah come yet. She asked many people this question, but nobody was ever able to give her and answer. In her journey to the Church she realized that Jesus WAS the messiah she had been searching for all of her life. And last Saturday like Thomas, Ali was finally able to touch the body of her Lord and Savior, with her own hands… eat His body and drink His blood… The best Easter gift ever…Happy Easter everyone! ALELUYA, Christ is our Lord is risen… He has risen indded!